The Papua New Guinea Government's move to double foreign debt levels could backfire with worse consequences than the multi-billion kina losses caused by the UBS loan and Oil Search share scam,Opposition Leader Patrick Pruaitch warned today. 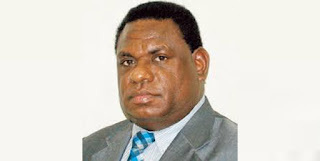 He said: “Having messed up management of the PNG economy, the Government has now moved to create a nightmare scenario in public debt management by revising its 2018 external net borrowing requirement to K3.34 billion from the 2018 National Budget estimate of K1.6 billion. “This is highly questionable at a time when the US Federal Reserve is raising interest rates for the first time since the 2008 Global Financial Crisis, placing downward pressure even on the Australian dollar. The Federal Reserve move will underpin a strong US dollar and make debt repayments much more onerous. The Opposition Leader said that to feed excessive spending, the government has raided the coffers of all State-Owned Enterprises. Most SOEs, such as Air Niugini and PNG Power, are now unable to declare profits or pay dividends to the Government, as shown in the 2018 National Budget. This year PNG Power, rather than paying a dividend, will receive K118.50 million from the budget, while Telikom PNG only receives K5 million. Mr Pruaitch said PNG’s economic situation will worsen considerably with the Government decision to switch a greater proportion of public debt from domestic to foreign borrowing, as announced in the 2018 MYEFO. “The Government has the mistaken notion that because interest rates in PNG are relatively high it is better to borrow from overseas. This is a simplistic view, given the big fall in value of the Kina against the US dollar in recent years. “Taken together the cost of overseas funds could amount to 20% or more, and would end up being a much bigger burden than domestic debt, causing the current cash flow crisis to worsen. “The Treasurer, Hon. Charles Abel, keeps talking about access to concessional loans, which could also be problematic because of currency movements. With limited access to such funds, the Government will be forced to seek commercial loans overseas, causing costs to escalate dramatically. “One of the reasons why overseasborrowing costs will be excessive is because financiers are aware that PNGfaces a severe shortage of foreign currency and may have difficulty servicingand repaying foreign debt. In the recently released 2018 MYEFO, Mr Abel said the Government was pursuing a Sovereign Bond of between US$500 million to US$1 billion “to shift our borrowing from the high cost and saturated domestic market”. It should be noted that the Bank ofPapua New Guinea was entrusted with raising of a Sovereign Bond in the 2016budget but failed, even though several other developing countries have done so. Mr Pruaitch said even borrowing through a Sovereign Bond would not come cheaply. Financial experts in 2016 said the cost of such borrowing would amount to about 25% annually in the case of PNG,far above interest rates available in the domestic economy. “With the 2018 MYEFO showing that debt servicing costs this year will exceed K2 billion, the mind boggles at the potential costs this country would face in the next five years in terms of debt servicing costs,” he said.